2.4G 4CH radio control UFO with shooting missile. 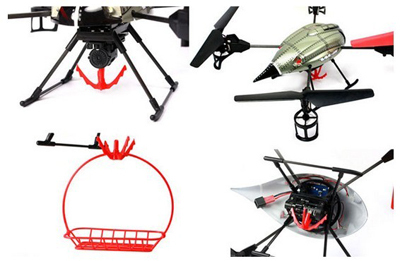 V999 "Future Battleship" Quadcopter is the perfect machine for those curious about quadcopters. Designed with simplicity in mind, it is light weight and its flight characteristics benefit from this design feature. Constructed of durable elastic materials and graphite booms the light weight enhances the crafts power to weight ratio. The 4 rotors are driven by 4 motors protected in plastic housings. The rotors are also gear driven which relieves the stress on the motors. The V999 handles exceptionally well. With the help of an on board gyro and adjustable control sensitivity, the V999 is perfect for pilots of different skill level and ages. The V999 is agile, and it has the ability to do flips and tricks. With the push of a button on the transmitter the aircraft enter "trick mode" allowing the pilot to do flips and rolls. The V999 also features LED lights that helps the pilot recognize the orientation of the helicopter and aids the pilot in low light situations. One very special feature of this V999 is the mounted rescue hook and basket. The V999 transmitter features a 2.4ghz radio system. This means you don t have to worry about signal interference and you have the ability to fly many of these at one time. The WLToys V999 4 Channel RC Quadcopter RTF with Fountain. This chopper is great for beginner and advanced pilots. 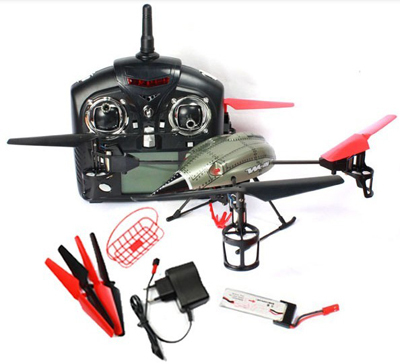 This Quad is built with an ultra light weight and strong body frame made from solid material and exquisite workmanship, makes it is easy to fly and it will resist most crashes. The unique thing about this chopper is that you can shoot out water from the fountain dispenser that is attached to the bottom of the quad. Just be careful because you can get really wet!! The V999 is controlled by a 2.4 GHz controller that has a built in LCD display screen that allows you to see speed trim tips, diversion trim tips, crab trim tips, stick mode indicator and battery level from the remote controller. Controlling up, down, forward, backwards, drifting left/right, rotating left/right, rolling movement and you can even control the speed! 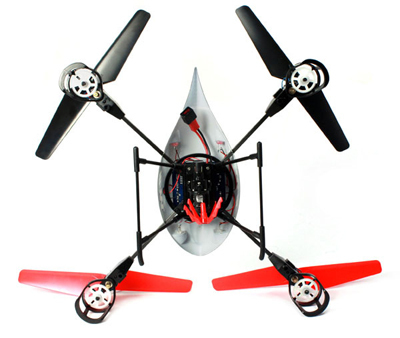 The 2.4 GHz allows you to go as high as 150 meters! That s pretty high! This chopper is perfect for indoors or outdoors (with gentle wind condition). The V999 is equipped with a gyroscope mechanism that ensures stability for a superior performance while in the air. Don t let us forget about how easy it is to charge this quad. The V999 comes with an AC charger that has a built in LCD light to let you know when your chopper is ready to fly!